It has one of the only Full Swing Golf Simulators in the area, STRICTLY for golf. 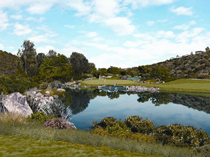 You will be able to play over 50 challenging golf courses from around the world, including Pebble Beach, Oakland Hills, and the Old Course at St. Andrews. The top courses from around the world come to life with immaculate fairways, crosscut greens, 3D trees, galleries of golf fans, water hazards, and even wildlife. These actual courses feature options to control factors like green speeds, wind variables, and weather conditions. Full Swing Golf has designed and built an entire course dedicated solely to practice, featuring approach shots, uphill, downhill, bump and run, lob, over trouble, and many more. The Visual Feed-back System can precisely pinpoint your weaknesses and strengths. 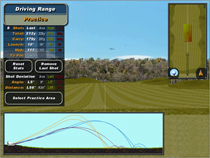 Real-time ball flight data is used to give you complete control over each and every shot. Speed, launch angle, direction, and course conditions are factored in. The top-view caddie gives you all of the information you need, including distance to the pin, lay-up yardages, elevation changes, and wind speed and direction. 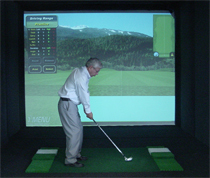 The Full Swing Golf Simulator is equipped with proprietary closest to the pin software and long drive capabilities. We can set up an individual contest, or add these features to a golf scramble or tournament you’re hosting in the simulator, complete with leader boards. The simulator features over 18 different modes of play, including skins, alternate shot, Ryder Cup formats and more!